Aghion P, Bloom N, Van Reenen J. 2014. Incomplete contracts and the internal organization of firms. Journal of Law, Economics and Organization 30(1): 37-63. Aghion P, Tirole J. 1997. Formal and real authority in organization. Journal of Political Economy 105(1): 1-29. Alchian AA, Demsetz H. 1972. Production, information costs, and economic organization. American Economic Review 62(5): 777-795. Amabile TM, DeJong W, Lepper MR. 1976. Effects of externally imposed deadlines on subsequent intrinsic motivation. Journal of Personality and Social Psychology 34(1): 92-98. Astley WG. 1985. Organizational size and bureaucratic structure. Organization Studies 6(3): 201-228. Baker G, Gibbons R, Murphy KJ. 1999. Informal authority in organizations. Journal of Law, Economics and Organization 15(1): 56-73. Barnard C. 1938. The Functions of the Executive. Harvard University Press, Cambridge, MA. Baron JN, Kreps DM. 1999. Strategic Human Resources: Frameworks for General Managers. Wiley, New York, NY. Bénabou R, Tirole J. 2003. Intrinsic and extrinsic motivation. Review of Economic Studies 70: 489–520. Blau PM. 1970. A formal theory of differentiation in organizations. American Sociological Review 35(2): 201-218. Blau PM. 1972. Interdependence and hierarchy in organizations. Social Science Research 1(1): 1-24. Bridoux F, Coeurderoy R, Durand R. 2011. Heterogeneous motives and the collective creation of value. Academy of Management Review 36(4): 711–730. Brocas I, Carrillo J, Dewatripont M. 2004. Commitment devices and self-control problems: An overview. In I. Brocas and J. Carrillo (Eds. ), The Psychology of Economic Decisions: 49-65. Oxford University Press, London, UK. Burns T, Stalker GM. 1961. The Management of Innovation. Tavistock Publications, London, UK. Burton RM, Obel B. 2004. Strategic Organizational Diagnosis and Design: The Dynamics of Fit. Kluwer, Boston, MA. Carpenter MA, Golden BR. 1997. Perceived managerial discretion: A study of cause and effect. Strategic Management Journal 18(3): 187–206. Casson M. 1994. Why are firms hierarchical? International Journal of the Economics of Business 1(1): 47-76. Caza A. 2012. Typology of the eight domains of discretion in organizations. Journal of Management Studies 49(1): 144–177. Child J. 1975. Managerial and organization factors associated with company performance – Part II: A contingency Analysis. Journal of Management Studies 12(1-2): 12-27. Coase RH. 1937. The nature of the firm. Economica 4(16): 386-405. Coff RW. 1997. Human assets and management dilemmas: Coping with hazards on the road to resource-based theory. Academy of Management Review 22(2): 374–402. Conger JA, Kanungo RN. 1988. The empowerment process: Integrating theory and practice. Academy of Management Review 13(3): 471–482. Coyle-Shapiro J, Kessler I. 2000. Consequences of the psychological contract for the employment relationship: A large scale survey. Journal of Management Studies 37(7): 903-930. Deci EL, Eghrari H, Patrick BC, Leone DR. 1994. Facilitating internalization: The self-determination theory perspective. Journal of Personality 62(1): 119-142. Deci EL, Koestner R, Ryan RM. 1999. A meta-analytic review of experiments examining the effects of extrinsic rewards on intrinsic motivation. Psychological Bulletin 125(6): 627–668. Deci EL, Ryan RM. 1985 The general causality orientations scale: Self-determination in personality. Journal of Research in Personality 19: 109–134. Deci EL, Ryan RM. 2000. The “what” and “why” of goal pursuits: Human needs and the self-determination of behavior. Psychological Inquiry 11(4): 227-268. Dessein W. 2002. Authority and communication in organizations. Review of Economic Studies 69(4): 811–838. Edwards R. 1979. Contested Terrain: The Transformation of the Workplace in the Twentieth Century. Basic Books, New York, NY. Finkelstein S, Boyd BK. 1998. How much does the CEO matter? The role of managerial discretion in the setting of CEO compensation. Academy of Management Journal 41(2): 179–99. Foss NJ. 2001. Leadership, beliefs and coordination: An explorative discussion. Industrial and Corporate Change 10(2): 357-388. Foss NJ. 2003. Selective intervention and internal hybrids: Interpreting and learning from the rise and decline of the oticon spaghetti organization. Organization Science 14(3): 331-349. Foss K, Foss NJ, Vázquez XH. 2006. ‘Tying the manager‘s hands’: Constraining opportunistic managerial intervention. Cambridge Journal of Economics 30(5): 797–818. Frey BS, Jegen R. 2001. Motivation crowding theory: A survey of empirical evidence. Journal of Economic Surveys 15(5): 589-611. Frey BS, Oberholzer-Gee F. 1997. The cost of price incentives: An empirical analysis of motivation crowding-out. American Economic Review 87(4): 746–756. Gagné M, Deci EL. 2005. Self-determination theory and work motivation. Journal of Organizational Behavior 26: 331-362. Galbraith JR. 1974. Organization design: An information processing view. Interfaces 4(3): 28-36. Galbraith JR. 1977. Organizational Design. Addison-Wesley, Reading, MA. Galbraith JR. 1995. Designing Organizations. Jossey-Bass, San Francisco, CA. Gottschalg O, Zollo M. 2007. Interest alignment and competitive advantage. Academy of Management Review 32(2): 418–437. Grandori A. 2001. Organizations and Economic Behavior. Routledge, London, UK. Grolnick WS, Ryan RM. 1989. Parent styles associated with children’s self-regulation and competence in school. Journal of Education Psychology 81(2): 143-154. Harley B. 1999. The myth of empowerment: Work organization, hierarchy and employee autonomy in contemporary Australian workplaces. Work, Employment, & Society 13(1): 41-66. Heath C, Knez M, Camerer C. 1993. The strategic management of the entitlement process in the employment relationship. Strategic Management Journal 14: 75-93. Heath C, Staudenmayer N. 2000. Coordination neglect: How lay theories of organizing complicate coordination in organizations. Research in Organizational Behavior 22: 155-193. Hill KG, Amabile TM. 1993. A social-psychological perspective on creativity: Intrinsic motivation and creativity in the classroom and workplace. In S.G. Isaksen, M.C. Murdoch, R.L. Firestien, and D.J. Treffinger (eds. ), Understanding and Recognizing Creativity. Ablex, Norwoord, NJ. Jensen MC, Meckling WH. 1992. Specific and general knowledge and organizational structure. In L. Werin and H. Wijkander (eds. ), Contract Economics. Blackwell, Oxford, UK. Karasek RA. 1979. Job demands, job decision latitude, and mental strain: Implications for job redesign. Administrative Science Quarterly 24(2): 285–308. Labianca G, Gray B, Brass DJ. 2000. A grounded model of organizational schema change during empowerment. Organization Science 11(2): 235–257. Lawrence PR, Lorsch JW. 1967. Organization and Environment. Harvard University Press, Cambridge, MA. Liao H, Toya K, Lepak DP, Hong Y. 2009. Do they see eye to eye? Management and employee perspectives of high-performance work systems and influence processes on service quality. Journal of Applied Psychology 94(2): 371–391. Lindenberg S, Foss NJ. 2011. Managing motivation for joint production: The role of goal framing and governance mechanisms. Academy of Management Review 36(3): 500–525. Malmgren HB. 1961. Information, expectations, and the theory of the firm. Quarterly Journal of Economics 75(3): 399-421. Meyer AD, Tsui AS, Hinings CR. 1993. Configurational approaches to organizational analysis. Academy of Management Journal 36(6): 1175-1195. Milgrom P. 1988. Employment contracts, influence activities, and efficient organizational design. Journal of Political Economy 96(1): 42-60. Milgrom P, Roberts J. 1990. The economics of modern manufacturing technology, strategy and organization. American Economic Review 80(3): 511-528. Miller G. 1992. Managerial Dilemmas. Cambridge University Press, Cambridge, UK. Mintzberg H. 1973. The Nature of Managerial Work. Harper-Collins, New York, NY. Mintzberg H. 1979. The Structuring of Organizations. Prentice-Hall, Englewood Cliffs, NJ. Mintzberg H. 1983. Structures in Fives. Prentice-Hall, Englewood Cliffs, NJ. Morgeson FP, Delaney-Klinger K, Hemmingway MA. 2005. The importance of job autonomy, cognitive ability, and job-related skill for predicting role breadth and job performance. Journal of Applied Psychology 90(2): 399–406. Okhuysen GA, Bonardi J-P. 2011. From the editors: The challenges of theory building through the combination of lenses. Academy of Management Review 36(1): 6-11. Osterloh M, Frey B. 2000. Motivation, knowledge transfer and organizational form. Organization Science 11(5): 538–550. Perrow C. 1967. A framework for the comparative analysis of organizations. American Sociological Review 32(2): 194-208. Puranam P, Raveendran M, Knudsen T. 2012. 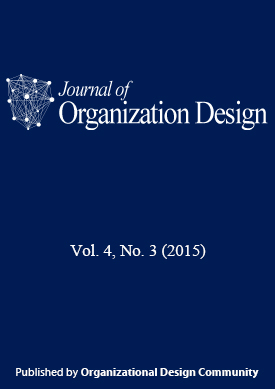 Organization design: The epistemic interdependence perspective. Academy of Management Review 37(3): 419-440. Radner R. 1993. The organization of decentralized information processing. Econometrica 61(5): 1109–1146. Roberts J. 2004. The Modern Firm. Oxford University Press, London, UK. Robinson SL. 1996. Trust and breach of the psychological contract. Administrative Science Quarterly 41, 574-599. Rousseau DM. 1989. Psychological and implied contracts in organizations. Employee Responsibilities and Rights Journal 2(2): 121-139. Rousseau DM, McLean Parks J. 1993. The contracts of individuals and organizations. Research in Organizational Behavior 15: 1-43. Ryan RM, Deci EL. 2000. Self-determination theory and the facilitation of intrinsic motivation, social development, and well-being. American Psychologist 55(1): 68–78. Seibert SE, Silver SR, Randolph WA. 2004. Taking empowerment to the next level: A multiple-level model of empowerment, performance, and satisfaction. Academy of Management Journal 47(3): 332–349. Sengul M, Gimeno J, Dial J. 2011. Strategic delegation: A review, theoretical integration, and research agenda. Journal of Management 38(1): 375–414. Siggelkow N. 2001. Change in the presence of fit: The rise, the fall, and the renaissance of liz claiborne. Academy of Management Journal 44(4): 838-857. Simon HA. 1951. A formal theory of the employment relationship. Models of Bounded Rationality, Vol. 3. MIT Press, Cambridge, MA. Sliwka D. 2001. On the costs and benefits of delegation in organizations. Journal of Institutional and Theoretical Economics 157(4): 568–590. Spreitzer GM. 1995. Psychological empowerment in the workplace: Dimensions, measurement, and validation. Academy of Management Journal 38(5): 1442–1465. Thomas K, Velthouse B. 1990. Cognitive elements of empowerment: An interpretive model and intrinsic task motivation. Academy of Management Review 15(4): 666-681. Thompson JD. 1967. Organizations in Action. McGraw-Hill, New York, NY. Van de Ven AH, Delbecq AL, Koening R . 1976. Determinants of coordination modes within organizations. American Sociological Review 41(2): 322-338. Van de Ven AH, Drazin R. 1985. The concept of fit in contingency theory. Research in Organizational Behavior 7: 333-365. Vining A. 2003. Internal market failure, A framework for diagnosing firm inefficiency. Journal of Management Studies 40(2): 431-457. Weinstein N, Ryan RM. 2010. When helping helps: Autonomous motivation for prosocial behavior and its influence on well-being for the helper and recipient. Journal of Personality and Social Psychology 98(2): 222–244. Williamson OE. 1985. The Economic Institutions of Capitalism. Free Press, New York, NY. Williamson OE. 1993. Transaction cost economics meets posnerian law and economics. Journal of Institutional and Theoretical Economics 149(1): 99-118. Williamson OE. 1996. The Mechanisms of Governance. Oxford University Press, London, UK. Woodward J. 1965. Industrial Organization. Oxford University Press, London, UK.